Prince Harry was at Camp Bastion in Afghanistan during an assault by the Taliban which killed two U.S. marines, but is safe. 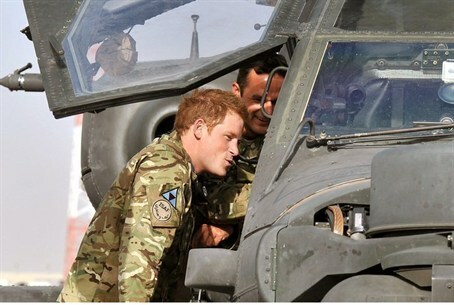 Taliban armed with suicide vests, guns and rockets stormed a heavily fortified airfield in Afghanistan where Prince Harry is deployed, killing two U.S. Marines and attacking aircraft in a major security breach. The militia, which is leading a 10-year insurgency against 117,000 NATO troops, said it carried out the assault to avenge a U.S.-made film deemed insulting to Islam that has sparked deadly riots across the Middle East and North Africa. The attack on Camp Bastion in southern Helmand province, one of the toughest battlegrounds of the war, started at 10:15 pm (1745 GMT) on Friday, said U.S. Army Major Adam Wojack. The base was cleared of enemy fighters on Saturday morning, he added. Prince Harry was never in danger, officials confirmed. Although the Taliban have vowed to kill the third in line to the British throne, one of its spokesmen told AFP that the assault "had nothing to do with the prince". General Sayed Malook, head of the Afghan army in the south, said a suicide bomber blew himself up, blasting a hole in the perimeter wall and allowing insurgents to storm inside with guns and rocket-propelled grenades. "As soon as they entered the base, fighting started. Afghan forces were not involved, they only helped to extinguish the fire," Malook told AFP. A fuel reservoir and an aircraft hangar were set alight and it took until dawn to extinguish the blaze, he said. The U.S.-led NATO forces said multiple aircraft and "structures" were damaged in the assault on the airfield, which is used by both American and British forces. Eighteen insurgents were killed -- including the suicide bomber -- and another was wounded and captured, said Wojack. They were dressed in camouflage, he said, but declined to say whether they were Afghan army uniforms. A defense official in Washington said two U.S. Marines were killed. NATO's U.S.-led International Security Assistance Force said some personnel were wounded, but gave no details in line with policy.